Get Ready To Get Back To 20/20. DIY or Mentored Approach, Start Here. Hi, I’m Jake Steiner, aka. His Holiness The Guru VonJakensteinen. In my long and winding journey from -5.00 diopter high myopia to glasses-free 20/20 eyesight, I figured a fundamental biological fact that my optometrist never told me: My myopia wasn’t an illness, and there was nothing wrong with my genetics. 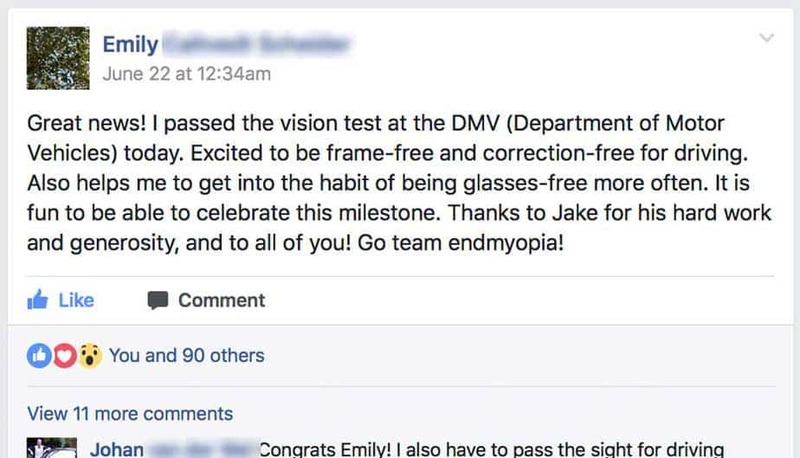 Here’s what I wish I had known when I got my first glasses: Myopia starts out as a strain symptom (referred to as ‘pseudomyopia’ or ‘NITM – near induced transient myopia’ in clinical research), and later becomes lens-induced myopia as you start wearing glasses with increasing diopter correction. And that’s why all the eye exercise programs don’t work – they fail to address the actual cause of our myopia. Want to reduce your own myopia, ideally get out of glasses completely? You’re mostly in the right place (minus maybe various rants and digression on behalf of your darling eye guru): Everything I’ve learned about in over a decade of research and helping thousands reduce their own myopia, you will find in the blog and free guides. Everything you need to meaningfully reduce your myopia is contained in the library of science articles, how-to guides, diopter discussion, student reports, Q&A, and video content. There is also the option for a mentored approach to help you get back to 20/20. This paid program includes direct support from your favorite imaginarily bearded sage and is probably the easiest possible way to figure out every piece of the myopia puzzle. Some people like free and DIY and figuring things out themselves, others prefer to spend some money and skip the tinkering. Either way you want to first learn the basics, then decide if you want to go free DIY or take advantage of the more structured approach. Feeling tempted and want to find out more about the fancy paid program option? There is actually no ‘buy now’ link on this page. No sales pitch, no payment form, no nothing. Because while uncle Jakey definitely loves money, now is not the time to get all trigger happy on your credit card. Even if (or especially if) you’re anxious to get started on improving your eyesight. Before you decide whether you want free DIY or paid BackTo20/20, you must first put the approach to the test your-actual-self. Use the 7 Day Free Guide to learn how to measure your eyesight, how to quantify eye strain, the impact of diopters, and the basics for meaningful, non-exercise, habit based vision improvement. While there is a learning curve here, this is absolutely one of the best substantiated ways to start taking back control over your vision. Don’t blindly buy into eye exercises and the many unsustainable approaches out there. Try our approach, understand the underlying vision biology, and test how your vision changes when applying the method yourself. Yes of course I picked a great example. One week. Seven days. Plenty of time go get the basics. Once you complete the 7 Day Free Guide, you will then have the option for an invite to BackTo20/20 if at that point you really prefer a mentored approach with support. At that point you’ll be well equipped to decide whether you prefer using the free tools provided in the blog, or the guided approach and one-on-one help from Jake. Be ready to spend about 20 minutes for each of the 7 days, learning about your eyesight, understanding the things that caused your myopia to increase, and looking at the large body of evidence in clinical science. Realize that this is a project. If you want real results, do spend the time to take action and follow the steps.